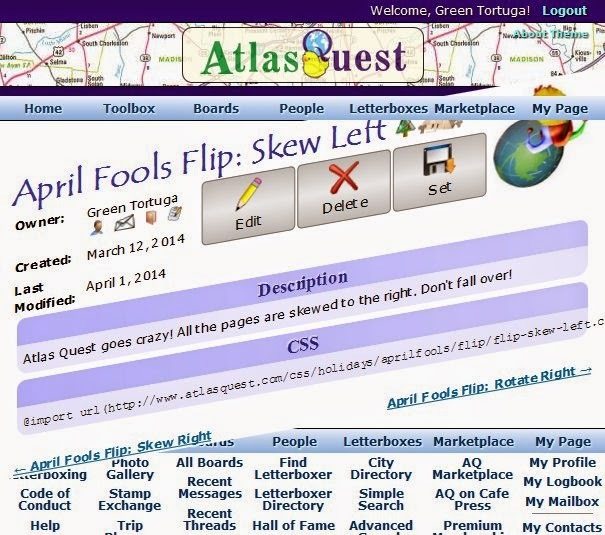 Yeah, so the upside down themes of yesterday were the 2014 April Fools Day prank for Atlas Quest. All the other problems the site has been having--the downtime, broken features, and so on--were not. I know more than one of you thought the whole server migration was a joke, but it was very much real and truly dreadful timing. If you want to thank the person who thought of the upside-down theme, that would be our very own Amanda from Seattle. =) She suggested it as an idea years ago, but at the time, I didn't have a clue how to make it work. There were some very new CSS3 properties that could do the trick, but no browsers supported them at the time. So I created the original April Fools Flip theme, which took all of about 10 minutes to do. I used this theme for about 5 seconds before I realized that the site was all but impossible to use. I couldn't leave it like that for an entire day! Which is when I started playing with other variations. The code to do these upside-down themes basically just say, "turn a specific element 180 degrees" to flip a page, but I can turn it any number of degrees. Why just use 180? Why not 90 degrees? Or 45 degrees? I also realized that I could rotate elements that had already been rotated! That's how the disorder theme was created. I rotated the entire page 180 degrees, then rotated just the header, content, menubars and footer in place 180 degrees, so the entire page actually ends rightside-up... but each of the elements are completely in the wrong order. Which I actually found surprisingly disorienting even though I could still work through it. That was a keeper. It was great! Thanks Amanda & Ryan for giving us such a laugh! Loved it! Thank you for the fun.